Plug in the lamp, be sure there's a bulb in it and see if it will turn on. Even a highly collectible lamp, such as a stained-glass piece made by Louis Comfort Tiffany, has significantly less value if it won’t actually illuminate. If the lamp works, that’s a plus. Unplug the lamp and examine it for signs of hardware repairs. A lamp of lesser value will show tell-tale signs that it’s been repaired over the years: a modern lamp switch, a modern Underwriters Laboratories sticker on the receptacle, a plug with a modern wider polarizing blade, a bright and shiny harp, and so forth. A valuable lamp will be intact with all its original parts. Most of these original parts will be highly oxidized or dulled by time. No plastic will appear on the lamp. Any knobs or buttons will be made of brass, wood or Bakelite. Gently pinch a fabric lamp shade between your thumb and index finger and feel the material. If it is greasy-feeling, and brittle to the touch, it may be old. If the material feels fresh and soft, maybe not. If the shade is very white, it’s a cinch the shade is newer. If it is almost tea-colored, it could be genuinely antique. Smell the shade: musty-smelling means aged, fresh-smelling means new. One oddly-colored section of stained glass, which matches no other glass in the shade, is a sign the section has been replaced. 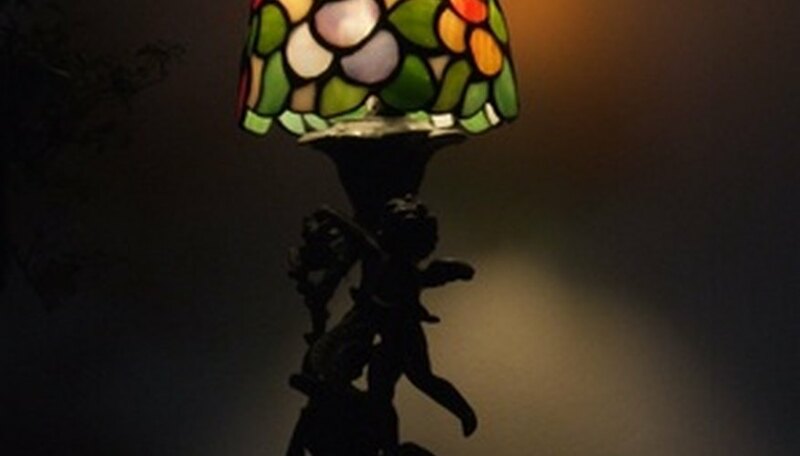 Any missing, repaired, replaced or cracked glass whatsoever on a stained-glass lamp lowers the value drastically. Look at the base and column of a ceramic table lamp with a magnifying lens. Look for any hairline cracks or signs that the lamp has been broken and glued back together. Any sign of a repair like this will lower the lamp’s value, no matter how well-done the repair job may be. Look for paint touch-ups; these will drop the value of the piece as well. Peel back any felt or pressboard that may be covering the base; don’t tear the felt or pressboard, though. Look for markings from the lamp manufacturer, such as a brand on wooden bases, or raised letters on the inside of a cast-metal base. Take a close-up photograph of anything you find. Return the felt or cover to its original position. Go to the Internet and conduct a search on the manufacturer of the lamp and learn about the history of that company and this particular lamp design, if possible. Some table lamp manufacturers, like Tiffany, are more collectible than others. Follow up by searching online antique forums and antique books and guides for current market valuations for this manufacturer, type and year of lamp. Compare the valuations shown for identical lamps (make, model and year) in these guides---in “Excellent,” “Good,” “Fair” or “Poor” condition--with the condition of your lamp. Adjust your market-value estimate accordingly. An "antique" is any item 100 years in age or more. A "vintage" item is younger than 100 years in age. A "collectible" item can be either an antique or vintage item--or a very recent item. A table lamp with a proven pedigree of having been owned by a historical figure—local or national—will always boost the value of the lamp. Verbal histories aren’t enough, however. You need photographic proof, along with verbal testimony, that this lamp belonged to the notable person. Hidden signs of repairs such as glued-up cracks and paint touch-ups are a warning sign: This piece has been “gamed” by some seller at some point in the past. If these repairs weren’t disclosed to you at the time you bought the piece, this unethical seller fooled you. Chances are you overpaid for the piece. If so, take the piece back to the dealer, if possible, and demand a refund. All experienced dealers know their goods in intimate detail; you usually won’t have problems getting a refund.